Most people in the US don't mind only having one SIM card slot on their phones. But if you absolutely need two card slots, or you're just looking for an Exynos-powered device instead of the usual Snapdragon versions sold in 'Murica, the dual-SIM Galaxy S8+ just keeps dropping in price. Now you can buy it for $629.99, about $187 off the MSRP and $36 less than the last time we reported on it. The prices for the unlocked dual-SIM Galaxy S8 and S8+ just keep dropping. It was only a few weeks ago that we brought you the news that you could grab one of Samsung's latest for $599.99 and $689.99, respectively. 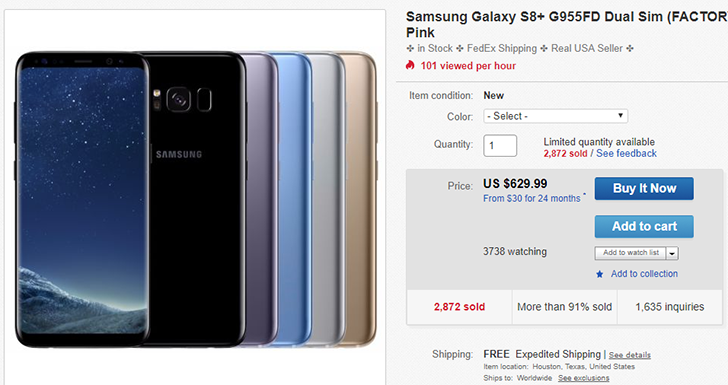 The same seller from that Deal Alert is back again, this time with even lower prices for both phones. 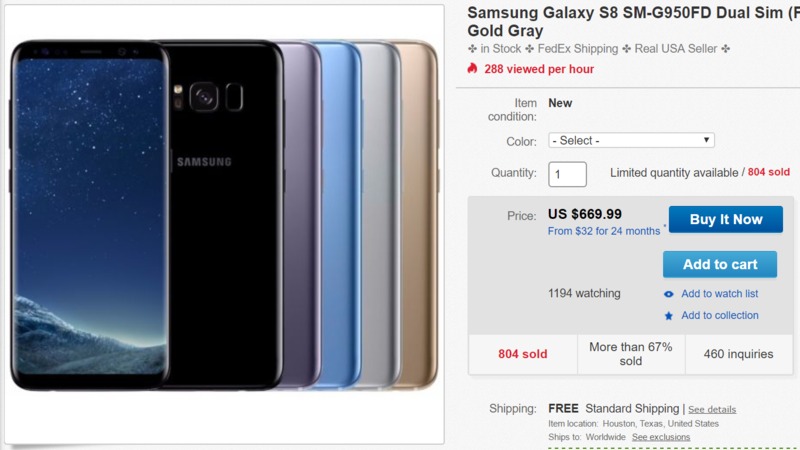 You can get the S8 for $579.99 ($145 off) or the larger S8+ for $665.99 ($159 off). This seller has a pretty solid track record, with a 99.7% positive feedback rating and a top rated certificate from eBay, so there shouldn't be much reason to be concerned about where you're buying from. The LG G6 is still one of the newest flagships out there, but it's already seeing some nice price cuts. An extremely reputable seller on eBay is offering the international, dual SIM G6 for just $419.99 - a lot lower than MSRP or any other retailers with the US unlocked model. The Galaxy S8 and S8+ have been out for a few months, so the sales are really starting to make a dent in the price tag. 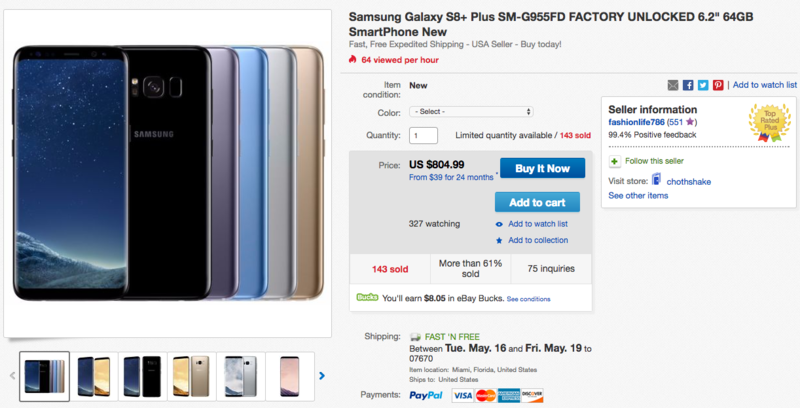 Today, the dual SIM variants are available on eBay for the lowest price we've see yet. The S8 is $640 and the S8+ is $728. Those are both more than $100 cheaper than the standard carrier variants. Samsung's latest flagship may be new, but it is quickly becoming affordable. And if you happen to be in the market for an unlocked dual SIM international model, then you are in luck. Today over at eBay you can pick up both the Galaxy S8 (G950FD) and Galaxy S8+ (G955FD) for a pretty great deal, at $670 and $770, respectively. In addition to being unlocked international phones, they are also using Exynos chipsets, if that happens to appeal to you. Color choices for the phones are gold, black, and gray. Here in the States, we get the Snapdragon 835 chip and a single nanoSIM slot in our Galaxy S8 smartphones. 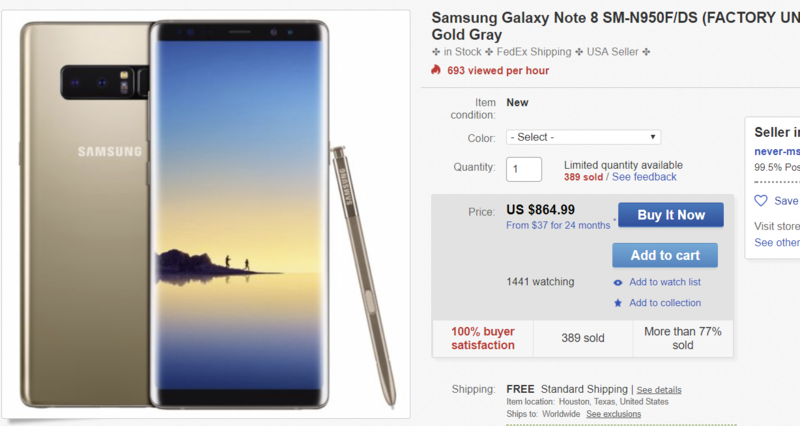 But should you want the more mod-friendly Exynos 8895 chipset (ironic) and/or an extra SIM slot, a little site called eBay can help you out. A newer but reputable seller has the SM-G955FD variant of the Galaxy S8+ for $804.99, with no tax in most states.